Copper is a lustrous, ductile, malleable, odourless solid with a distinct golden-red or reddish-brown colour. ■■ Copper is a lustrous, ductile, malleable, odourless solid with a distinct golden-red or reddish-brown colour. It is an essential trace element, being the third most abundant trace element in the body, and is an important catalyst for haeme synthesis and iron absorption. Metallic copper itself probably has little or no toxicity, although reports in the literature are conflicting. ■■ Copper salts produce toxicity. 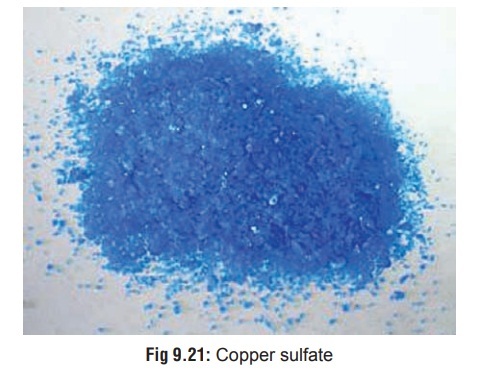 Soluble salts, such as copper sulfate (Fig 9.21), are strong irritants to skin and mucous membranes (Table 9.9). · Copper has excellent electrical conductivity, corrosion resistance, malleability and ductility, which make itvery useful as an industrial metal. · Copper is widely used in applications for which high electrical and thermal conductivity are needed. Copper whiskers are used in thermal and electrical composites. · Copper is used in important alloys such as bronze (copper alloyed with as much as 10% tin) and brass (copper alloyed mainly with zinc). Money metal, another copper alloy, is copper alloyed with nickel. · Copper is useful in electroplated coatings and under- coatings for products made from nickel, chromium, and zinc, and in cooking utensils. Copper is also made into corrosion-resistant plumbing pipes, used in heating and roofing materials for building construc- tion, and has applications in industrial machinery and in automobiles. · Copper’s contraceptive effects (as a spermatocide) are exploited for intrauterine devices. Its contraceptive effects permit the use of a smaller device, resulting in fewer side effects such as pain and bleeding. · Copper oxide: Cupric oxide (black copper oxide) (CuO), or Cuprous oxide (red copper oxide) (Cu2O)—Copper oxide is used as a catalyst and a pigment for ceramic, glass, enamel, and porcelain; it is used in copper metallurgy, pyrotechnics and welding and in the manufacture of rayon; and it is found in batteries, electrodes, desulfurising oils, paints fungicides and insecticides. · Copper acetate: Cupric acetate or Cuprous acetate— Copper acetate is used as a paint pigment, insecticide, and fungicide. · Copper carbonate: Cupric carbonate—Copper carbonate is used in pigments, pyrotechnics,­ insecti- cides, fungicides and brass colouring­. · Copper chloride: Cupric chloride (CuCl2) or Cuprous chloride (CuCl)—Copper chloride is used as a disin- fectant, in metallurgy, for the preservation of wood pulp, in photography, in water purification, and as a feed additive. · Copper nitrate: Cupric nitrate (CuN2O6)—It shares many uses with copper chloride and, in addition, isused preferentially in pharmaceutical preparations and in paints, varnishes and enamels. · Copper cyanide: Cuprous cyanide (CuCN)—Its chief use is in the electroplating of copper on iron. · Copper sulfate/sulfide: Cupric sulfate, Cupric sulphide (CuS), or Cuprous sulfide (Cu2S) —It is used as a fungicide, molluscicide and wood preservative, for water treatment as a bactericide and algaecide, as a mordant, in leather tanning and hide preservation,mordant, in leather tanning and hide preservation, and in some fertilisers. It is also used medicinally as an emetic, and in several intrauterine contraceptive devices. About 10 to 20 grams of copper sulfate. · The safe daily intake of dietary copper is 2 to 3 mg/day, while the actual requirement is only 0.8 mg/day. It is required for the functioning of enzymes such as catalase and peroxidase. · Copper is normally present in serum in two forms—one which is bound to albumin (7% of total serum copper), and one which is bound to the copper enzyme caeruloplasmin (93%). Urine normally contains only traces of copper (5 to 25 mcg/day). About 0.1 to 1.3 ng of copper is excreted through the bile daily and lost in the faeces. Total body copper content is 150 mg.Copper can be absorbed through GI mucosa, and from intact skin. · Copper intoxication is characterised by myalgia, abdominal pain, vomiting (bluish or greenish),* diar- rhoea, acidosis, pancreatitis, methaemoglobinaemia, haemolysis, jaundice, oliguria, renal failure, seizures, delirium and coma. · Hepatomegaly, liver tenderness, increased levels of transaminase and jaundice may occur on the second or third day after ingestion of copper salts. · Acute renal failure develops in 20 to 40 percent of patients with acute copper sulfate intoxication and is believed to be mainly due to intravascular haemolysis.This might also occur after ingestion of other copper salts. Anuria or oliguria may develop 24 to 48 hours after ingestion, accompanied by an increase in BUN. sore throat, and conjunctivitis, while copper oxide is one of the incriminating agents in metal fume fever. · Eye exposure to copper can result in conjunctivitis and corneal ulceration or turbidity as well as palpebral oedema. Copper or copper alloy foreign bodies lodged in the eye (chalcosis lentis) can result in uveitis, abscess, serious injury or loss of the eye; over time, the copper may dissolve and disseminate to the lens, cornea and iris, where it may produce a greenish- brown discolouration of the anterior capsule visible by slit-lamp microscope. · Chronic inhalation of copper sulfate spray used as an insecticide in vineyards can cause vineyard sprayer’s lung disease characterised by a histiocytic granuloma- tous lung. Liver damage is also common. · Chronic contact with swimming pool water containing algicidal copper chemicals can cause green hair discol- ouration. · Churches in some developing countries distribute “spir- itual green water” to devotees which contains copper sulfate. When this is ingested, serious toxicity and even death can result. · Cooking in copper or brass vessels can cause copper poisoning due to verdigris. Copper poisoning can also result from the leaching of copper containers in which carbonated water, citrus fruit juices, and other acidic beverages have been stored. · Chronic copper toxicity is the hallmark of Wilson’s disease, an autosomal recessive genetic disorder in which there is deficiency of caeruloplasmin. Discolouration of the peripheral part of the cornea (Kayser-Fleischer ring) (Fig 9.22) is a pathognomonic feature of this condition characterised by deposition of copper in parenchymal tissue. A ‘sunflower-like’ discoloration of the most ante-rior layers of the lens has also been reported in patients with Wilson’s disease. · Metal fume fever, wheezing and rales have been reported in workers exposed to fine copper dust. Dyspnoea has developed after oral copper exposure. · Skin exposure can produce severe irritation, itching, erythema, dermatitis and eczema. · Serum caeruloplasmin level: A value of 35 mg% or less at 24 hours is associated with serious toxicity. · Blood copper level: If this is elevated beyond 1.5 mg/100 ml, there is likelihood of serious toxicity. Average normal levels are 1.09 mg/L for men, 1.20 mg/L for non-pregnant women and 2.39 mg/L for pregnant women. · Urine level: Normal daily excretion of copper in the urine is less than 0.6 micromole/day. · Radiography: Metallic copper is radiopaque. X-rays may be useful to establish diagnosis. Copper salts are not consid-ered radiopaque. · Haemodialysis is said to be useful in the early stages of poisoning when the metal is still circulating in the blood-stream as free copper. · Administration of egg white or milk orally may help in detoxifying copper resulting in the formation of an albu-minate. · Stomach wash can be done with a solution of potassium ferrocyanide. It converts the copper salt (especially copper sulfate) into insoluble cupric ferrocyanide. · Induction of emesis is contraindicated. · There is little clinical experience in the use of chelators in the setting of acute copper intoxication. Data on efficacy is derived from patients with chronic copper intoxication (Wilson’s disease, Indian childhood cirrhosis) and animal studies. · D-penicillamine is considered the drug of choice forWilson’s disease, a condition of chronic copper over-load. Chelation therapy is generally recommended in symptomatic patients. If the patient is asymptomatic, confirmation from the laboratory may be received before instituting chelation therapy. n Usual Adult Dose: 1000 to 1500 mg/day divided every 6 to 12 hours, before meals. n Usual Paediatric Dose: Initially 10 mg/kg/day, gradually increase to 30 mg/kg/day divided in two or three doses as tolerated. Doses up to 100 mg/kg/ day in four divided doses may be used depending on the severity of poisoning and adverse effects. Give before meals; maximum 1 gm/day. n Pregnancy: Use of penicillamine in pregnancy has been associated with connective tissue abnor-malities, hydrocephalus, cerebral palsy, cardiac and great vessel anomalies, webbing of fingers and toes, and arthrogryposis multiplex. However, the teratogenic effect when used in low doses or for short periods of time, as in metal chelation, has yet to be determined. · Dimercaprol has been used in patients with acutecopper sulfate intoxication but data regarding efficacy are lacking. The usual dose is 3 to 5 mg/kg/dose deep IM every 4 hours for 2 days, every 4 to 6 hours for an additional 2 days, then every 4 to 12 hours for up to 7 additional days. · Unithiol is not FDA-approved in USA, but it has beenused with beneficial effects by some investigators. The usual dose is 5% solution IM or SC 5 mg/kg three or four times during the first 24 hours, 2 to 3 times on day two, and 1 to 2 times daily thereafter. · Calcium disodium edetate has been used to treatpatients with acute copper sulfate intoxication but data regarding efficacy are lacking. The usual dose is 75 mg/ kg/24 hours deep IM, or slow IV infusion given in 3 to 6 divided doses up to 5 days; may be repeated for a second course after a minimum of 2 days; each course should not exceed a total of 500 mg/kg body weight. · Symptomatic measures—antacids and ranitidine for preven-tion of gastric erosions, dopamine for shock, etc. o Remove contact lenses and irrigate exposed eyes with copious amounts of room temperature 0.9% saline or water for at least 15 minutes. o If irritation, pain, swelling, lacrimation, or photophobia persist after 15 minutes of irrigation, an ophthalmologic examination should be performed. o Remove contaminated clothing and wash exposed area extremely thoroughly with soap and water. A physician may need to examine the area if irritation or pain persists after washing. o Metallic copper embedded in the skin has produced increased serum copper concentrations. Monitor serum and urine copper concentrations in patients with signifi-cant dermal exposure. o Chelation therapy should be considered if copper concentrations are excessive. · Disorder of hair colour—Use of shampoos containing peni-cillamine (250 mg in 5 ml of water and 5 ml of shampoo) or EDTA have been effective in removing green colour from hair due to copper exposure. · Jaundiced skin and conjunctivae. · Greenish or bluish stomach contents. · Hepatic and renal necrosis. In India, the incidence of suicidal ingestion of copper sulfate was quite high till recently. Of late, there has been a decline.